Are you doing your own digital marketing for an event, conference or association? If you’re a Digital Marketing Director or CEO, chances are you are currently responsible for this or at least have been before. I understand how stressful this can be and are aware of the complexities it entails. In the modern climate, many corporations, associations and destination bureaus are being faced with over-burdened staff and diminishing spend. Not to mention a lack of expertise or know how in the rapidly changing digital sphere. As a result, many of them have had to reassess their event strategies, thus turning to outsourcing for their event marketing needs. There’s a wide array of benefits when it comes to outsourcing a digital marketing company to manage your event requirements. This is because running an event is an intricate and expensive undertaking so the preparation and management of every detail count, especially when it comes to foot traffic, the overall success of your event, and maximising your budget. How do you know when to outsource? Have you thought about the reason as to why one would? 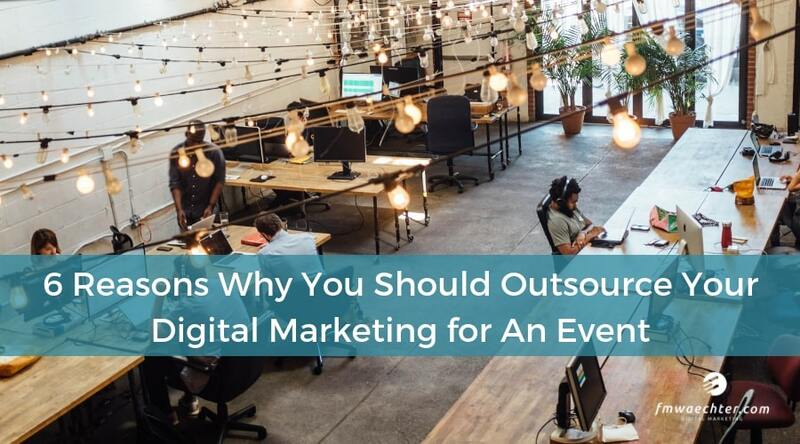 Here are our 8 reasons why you should outsource your digital marketing for an event from this moment onward. This one is seemingly obvious but if you outsource your digital marketing needs to an agency that does it for multiple clients daily, you’ll save so much time because of their experience, the number of people that will be working on your event simultaneously and their ability to get tasks done quickly and efficiently. Agencies are also aware of all the added value you can acquire through digital marketing and are experts at implementing strategies in order to do so – getting you more for your money, more out of the timeframe and adding to the experience with content creation ideas. This also means a decrease in expenditure. Getting more done in less time because of able bodies and experience means getting the most out of your budget. As the saying goes, time is money and you’ll find that by using a digital marketing agency, you’ll save more money than you ever anticipated. Think about if you had to go at it alone. You’d have to hire several experts to help you action strategies effectively and efficiently. With a digital marketing agency, the package or hours you pay for will cover the huge cost of attempting it internally, never mind the tedious task of having to brief new employees on your vision. Their staff already have the depth of skills needed which means no HR headaches either. By outsourcing to a digital marketing company, you’ll be tapping into years’ worth of collective experiences such as using content marketing methods, video and social media marketing which is backed by professional data analytics to gain trust from your attendees. At FM Waechter, targeted, interactive and measurable promotion are used for events. An in-depth digital marketing plan is the foundation of a successful event and achieving your goals in terms of interest and numbers through the door. When the digital marketing aspect of your event is covered, it gives you the time to focus and expand upon the things that you do best. By freeing up internal resources, you will effectively be enabling your team to be able to focus on the areas where they maximise their time. As you’ll be well aware of, a successful event demands a detailed master plan and a timeline and budget that is followed strictly. This pertains to the practical, physical side of the event. By outsourcing your digital marketing, you and your team will be able to focus on these defining aspects. Digital marketers are creatives. They are capable of marketing your event or conference in an authentic, captivating, and compelling way. They will also do so objectively; sometimes one can be too close to the project. Never underestimate an outside perspective on your ideas. Expert digital marketers will assist in making the event a success because they have a world of ideas and industry insight. Further to this, they execute these ideas and strategies with a marketing mindset and instinct toward your expectation and vision. When you outsource your digital marketing, these individuals will become your partners in strategizing. They will work with your people on a daily basis. This will result in your staff learning crucial methods from them. This can only be a positive thing for building the expertise of your internal resources and may just save you money further down the line. With so much on your plate and so much to be offered by outsourcing this critical element of you event, why hesitate? Speak to a specialist in digital marketing for events immediately! For advice, solutions and ideas on how to make the most of the opportunities that Digital Marketing offer your event, get in touch with FM Waechter!